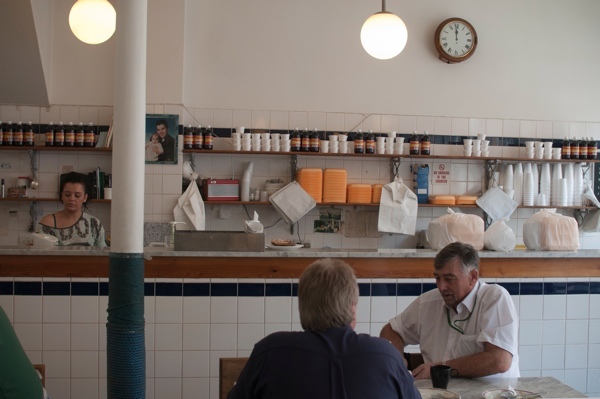 Already, months have passed since Spitalfields Life contributing photographer Sarah Ainslie and I enjoyed the first instalment of our crawl around all the Pie & Mash Shops in the East End, indulging ourselves recklessly in their irresistible mouth-watering hot meals. And so, with renewed appetite we set out again, led by an inescapable craving for a some good meaty pies and, I am relieved to report, we were not disappointed in our quest. As before, we commenced in the East and worked our way across the territory, starting our journey at Maureen’s Cockney Food Bar in the lively Chrisp St Market – boasting over thirty years of pie making and recently voted as the East End’s number one hidden gem by users of the Docklands Light Railway. 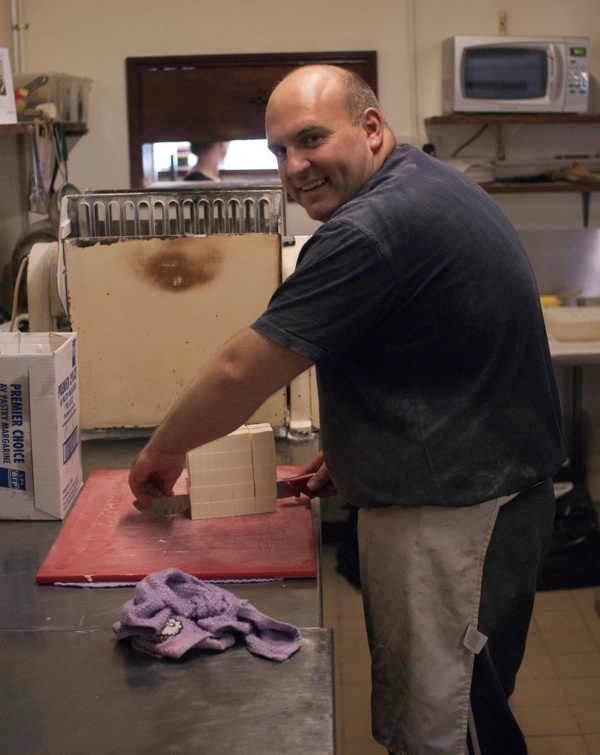 Since Maureen retired years ago, the credit goes to her son Jason who bakes the pies and his wife Karen who keeps everything running smoothly. Yet even Karen was a little flushed by current events, which had resulted in a stream of photographers and televisions crews over successive days, and Sandra’s Bullock’s sister – a food journalist and pastry chef – who came in a limousine to savour the pies at Maureen’s. I was immediately endeared to this friendly and supremely unpretentious establishment that has triumphed on nothing less than the superlative quality of its pies. No wonder trucks arrive from Liverpool and Newcastle before dawn each morning to carry away fresh deliveries to the North of England, and pies are shipped internationally to Spain, Italy and South Africa where ex-patriot East Enders rely upon regular supplies from Maureen’s to ameliorate their homesickness. The shop is shut on Monday because that is when Jason goes at three in the morning to buy his beef in person at Smithfield Market and then spends all day mincing it by hand. Only he and Maureen know the secret pastry recipe in use for over half century, Karen informed me, raising her eyebrows for effect. And if you are planning a party, be aware that they supply pies in bakers’ dozens – thirteen for the price of twelve – and you get free liquor (as the delicious parsley sauce is known) if you bring your own jug. Ideal for weddings, Karen emphasised. 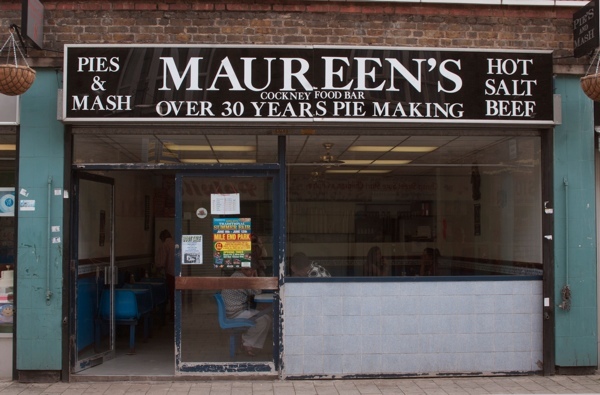 Maureen’s Cockney Food Bar is the East End’s next hot food destination, so you had better go before toffs from Islington find their way across to Milwall or Sandra Bullock’s sister returns with Sandra Bullock. While the regular diners ate their pies contentedly in near silence, seated at marble tables within the airy space of this former Barclays Penny Bank, Joseph expounded to me enthusiastically about the varieties of parsley available at different times of the year and how this effects the nature of the liquor. “We’re using Spanish parsley at the moment,” he explained, delighting in its tangy flavour and the viscous sauce it makes once it has been minced up. “You splash it on your arm and it stays like paint!” he exclaimed in wonder. 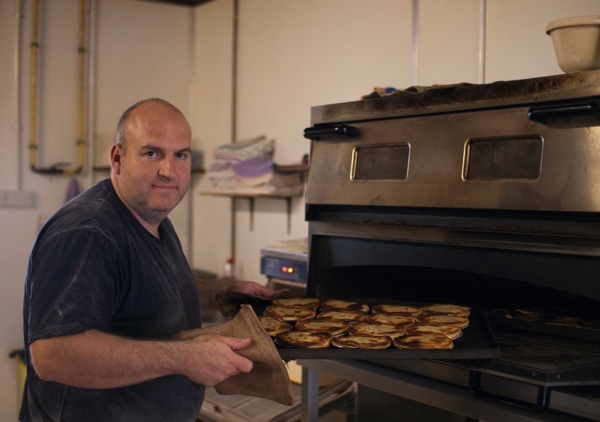 Over coming months, to complement the pies made here from a recipe unchanged in four generations of piemakers, there will be fresh liquor of - successively – English, French, Spanish, Italian and Turkish parsley. Naturally, Joseph was curious to learn how his pies in Hoxton St compared to those of his brother Bob in Broadway Market, but since they both use the same recipe and I did not wish to become the catalyst for any unfortunate sibling conflict I chose my words with care. Let it be known that I found Joseph’s pies gratifyingly meaty with a sweet gravy that was tasty and rich, and I shall be coming back here again. It says something that the floor of the dining room is thoughtfully scattered with sawdust to absorb gravy splashes caused by over-enthusiastic pie eaters. 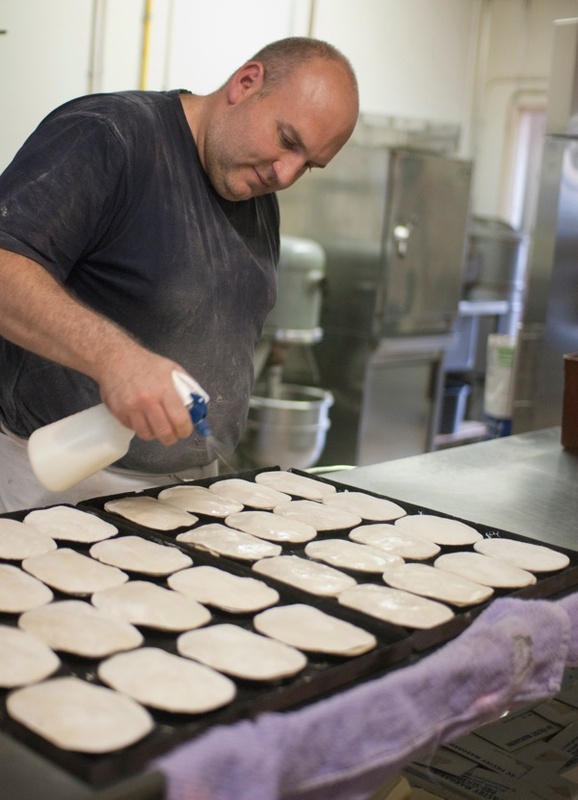 “My old grandmother ate pies every day of her life and when she died at ninety-three, she still had all her own teeth,” added Joseph in afterthought, as further advocacy – if such were needed – of the health benefits of a diet of pie and mash. 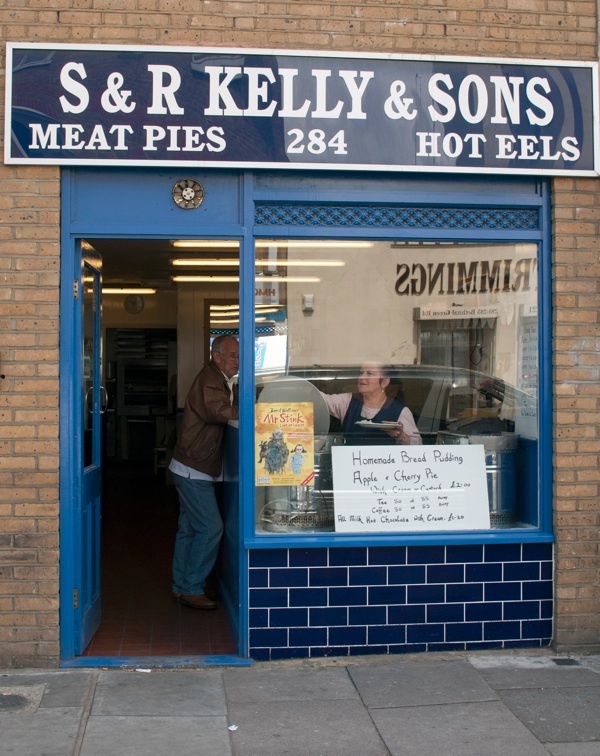 Sarah & I managed to fit in one more Pie and Mash Shop just to make our day complete, S & R Kelly & Sons in the Bethnal Green Rd. This appealingly intimate little blue and white shop with room for just a handful of diners is lined with matchboarding and tiles, and has an interior of Japanese simplicity. 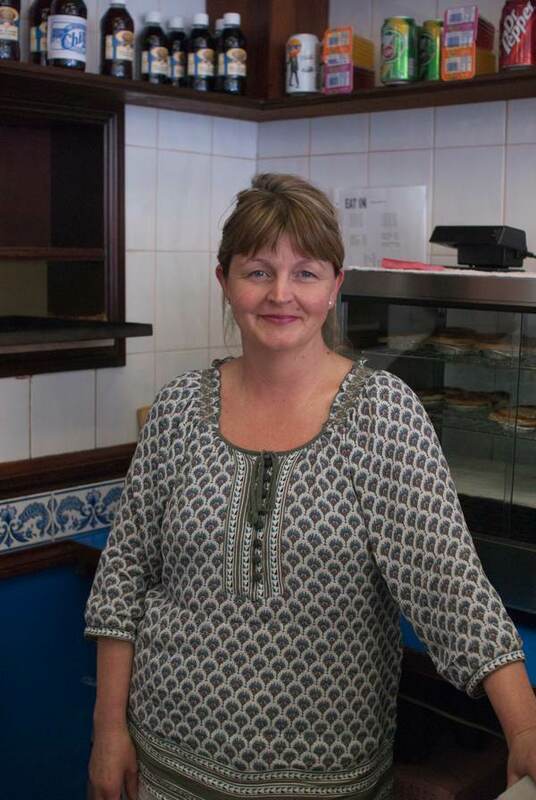 Here we met Jill who has worked for proprietor Robert Kelly for fifteen years, serving behind the counter. She explained that out of all the Kelly’s Pie & Mash Shops this was the original, established over one hundred years ago. “Most people seem to like this one!” she agreed when I complimented her on the shop, “They all say it’s the best one. 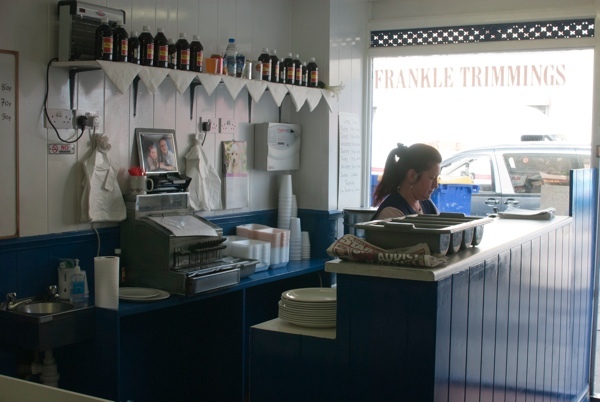 Even people that move away, the first thing they do when they get off the plane is come here and have pie and mash.” We were very sorry to have missed Jill’s oldest regular customer, a venerable lady of a hundred and three who had died a few weeks earlier. “She had been Robert’s milk lady when he was at school and she loved eels, and he didn’t use to charge her,” admitted Jill in affectionate reminiscence. 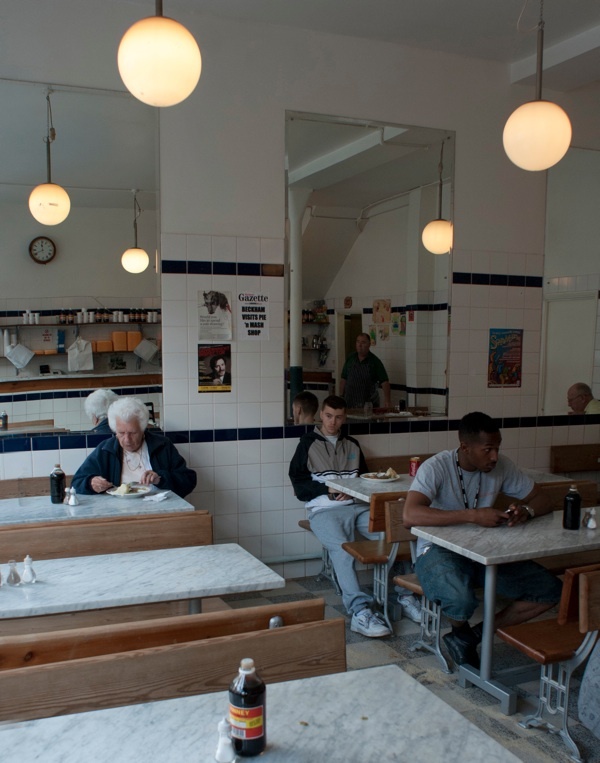 Of all the various communal spaces in the East End – even more than pubs or churches – Pie & Mash Shops exist in the public consciousness as the most celebrated locations of emotional memory, and the explanation lies in the food. 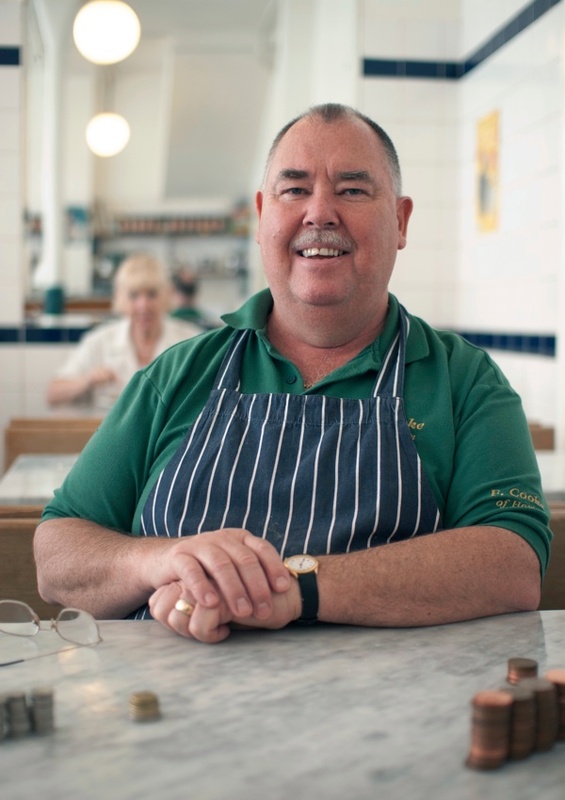 East Enders love their Pie & Mash, because by enjoying this glorious meal they can participate in the endless banquet which has been going on for generations, longer than anyone can remember, and which includes all their family, relatives and loved ones, both living and departed. 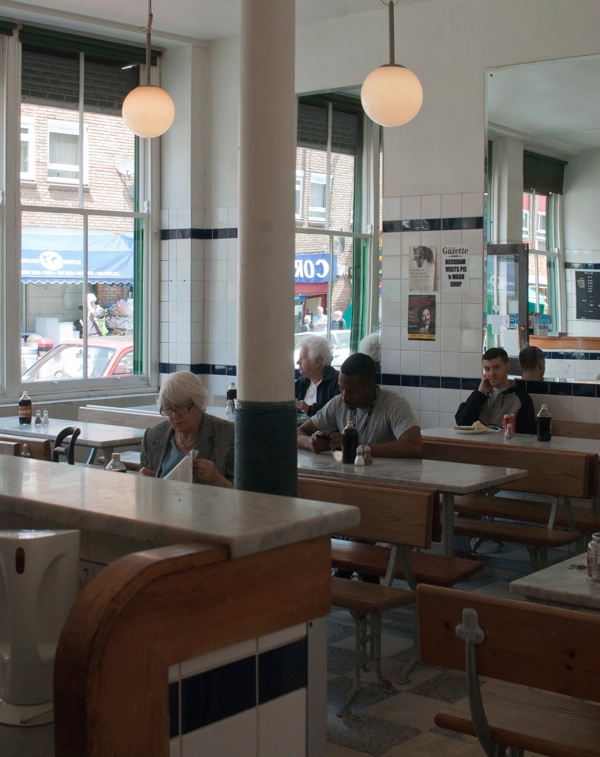 The world has changed and the East End has transformed, but the Pie & Mash Shops are still here and the feast goes on. 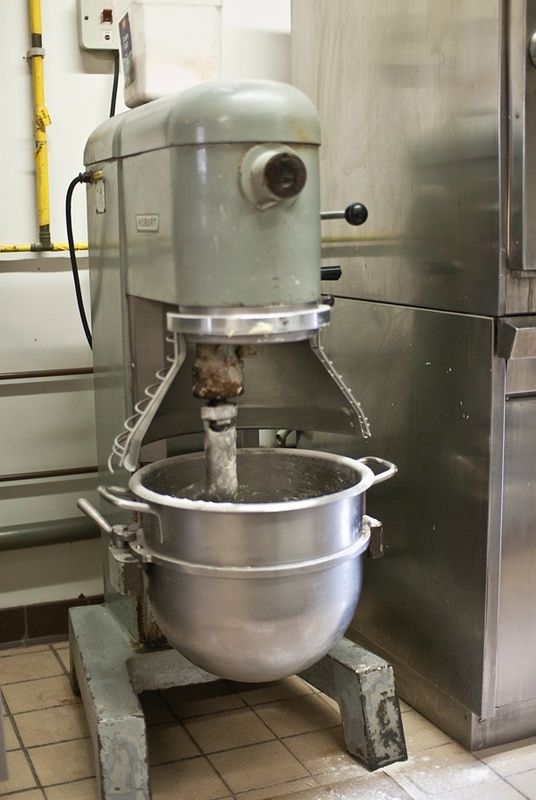 Jason Patterson dices margarine for pastry. Jason sprays milk onto the pie crust. 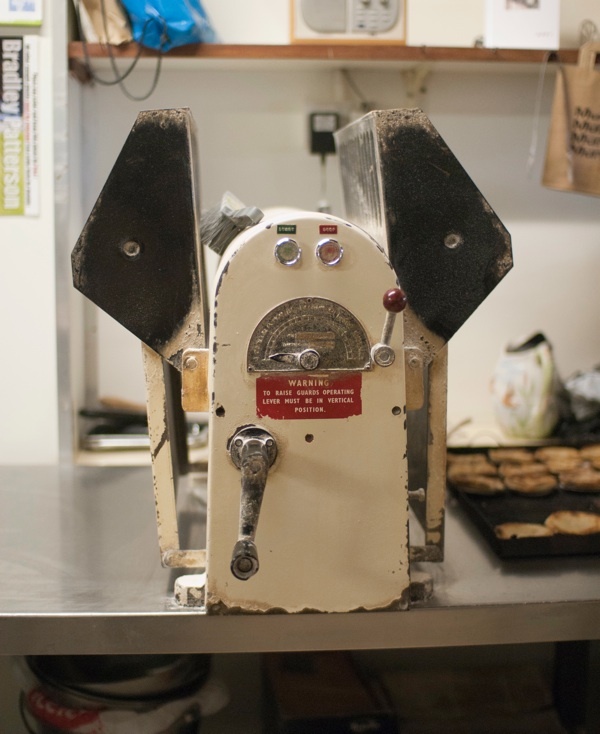 Jason has a secret pastry recipe, in use for half a century and known only to himself and Maureen. Karen Patterson, the Queen of Chrisp St Market. 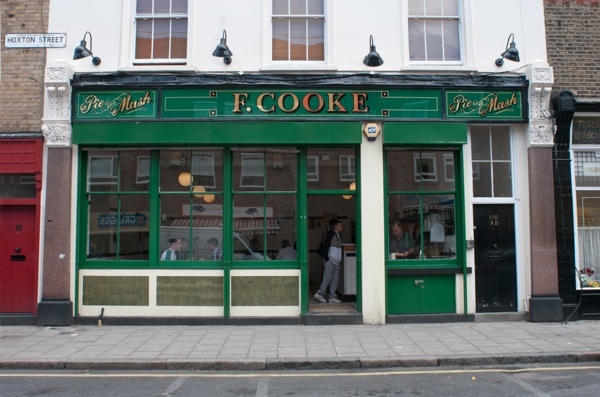 F.Cooke in Hoxton, David Beckham’s preferred Pie & Mash Shop. Contented diners eat pies in near silence. Ladling the liquor made with Spanish parsley. 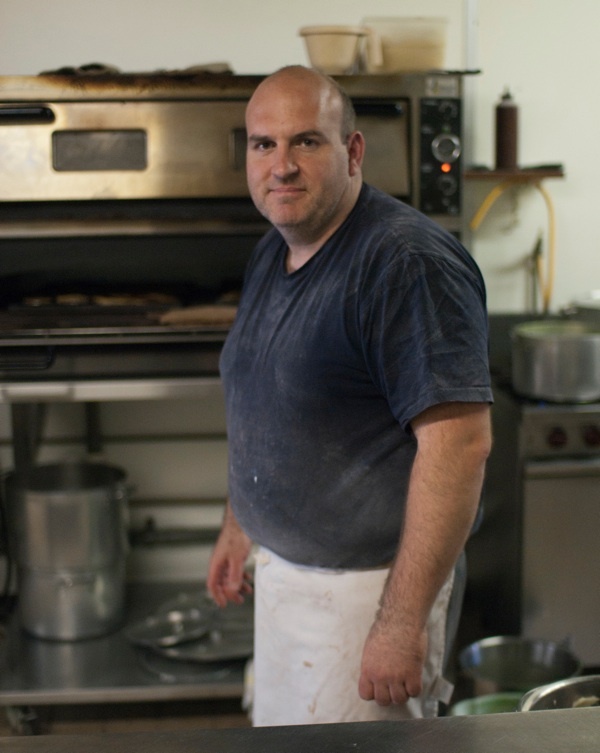 Joseph Cooke, fourth generation piemaker. How funny…I wrote about our local one today…! 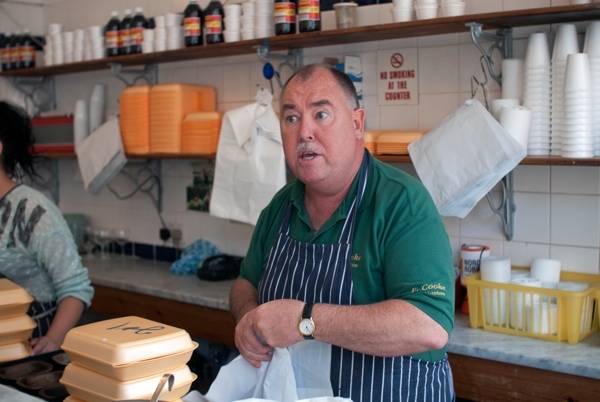 Favourite pie and mash is an oxymoron for me – I’m a vegetarian!!!!! Tee hee!! Great review, but some info on prices would have been good. The Crisp Street one is the best we have, although the Greenwich one, now sadly squeezed out of it’s long established shop by developers and exiled to a little temporay cabin up the road gets it really right too. Hello, I see you have made your rounds to London’s pie and mash shops, but I don’t believe you have visited us here at Arments Pie and Mash shop . We have been serving traditional pie and mash for over 100 years and think you will enjoy our tasty green liquor that accompanies the meal. Come try us out the next time you are in Walworth.